Among the many Jews set wandering by the Iberian expulsions of 1492 was Abraham Zacuto, astronomer and cartographer to the court of Ferdinand and Isabella. On August 2, the day before his protégé Christobal Colon set sail to the west, Rabbi Abraham, having refused baptism, slipped over the border from Spain into Portugal. There he found work at the court of King Joao II, but the edict of expulsion soon followed. In 1497, Joao’s son Manuel, bowing to the Spanish monarchs and to the Infanta, whom he was contracted to marry, ordered that all Jews in his land, both those native to Portugal and those who had lately found refuge there, either undergo baptism or face death. Zacuto, whose charts and metal astrolabe, the first of its kind, had guided Vasco da Gama to India, found himself once again in motion. At the port of Lisbon, those under edict struggled to board waiting ships. Forbidden to take anything of value with them, most had nevertheless managed to secrete about their persons a few gold coins or small gemstones, hoping to exchange these for the necessities of life in whatever miserable place the Highest saw fit to bring them. Rabbi Abraham boarded a ship that was bound for Salé, on the Maghrebi shore. He brought with him a small trunk containing his charts and astronomical tables, as well as his holy books, and, sewn into the hem of his round cape, a ruby of considerable worth. It was the gift of his housekeeper, Mirem, who had submitted to baptism rather than flee again, and was now a Christian. “Take it, Rabbi,” she had told him, “you will need it more than I.” This was not true, as events proved. In Salé, the itinerants were not allowed to land until they had forfeited something of value to the agent of the Moroccan King, a tall Ishmaelite who stood at the head of the gangway, stopping each passenger with a jab of his upturned palm. 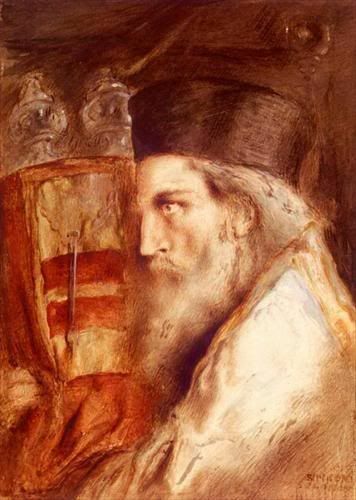 Rabbi Abraham understood at once what was expected and, not wishing to part with his charts or tables, the work of his life, nor with his books, he carefully undid the ruby from the hem of his cape. It was a clear, fiery stone, the size of a quail’s egg, ingeniously faceted and cool to the touch. When he reached the gangway, he placed it in the palm of the agent, who received it with a murmur of satisfaction and stepped to one side so that the Rabbi might disembark. From Salé, Zacuto traveled inland to the capital city of Fez, and there, in the neighborhood known as the mellah, where the Jews of Fez were domiciled, he found lodging in the family of a well-known physician. The house was modest, like all Jewish houses in the kingdom at that time, having been constructed by themselves out of simple planks and roofed with a patchwork of skins. But in the courtyard there was a bathhouse, and here the Rabbi made a surprising discovery. When he had removed his cape and begun to brush it, he felt a round something sewn into the hem. Tearing away the stitches, the same tiny stitches Mirem had used, he was astonished to see the ruby lying there, couched in the dust of travel. It was the same stone, it could be no other, unless—and this is what he finally concluded—Mirem had given him two such stones, a magnificent pair. Not long after this, violence against the Jews of Fez began to swell, as it periodically did, and Rabbi Abraham traded the second stone for passage across the Maghrebi desert to the city of Tlemcen. And here he discovered, as at Fez, that the stone had reappeared, sewn tightly in the hem of his round cape. Now he was truly frightened. The stone shone brilliantly in his palm, the very same stone, and as he looked into its red depths, trying to make out its strange power, it occurred to him that this was the beginning of idolatry, and that he should surely destroy the stone and save himself. He did not, however. He kept it, and exchanged it a third time for passage to the port of Oran, and a fourth time for passage on a ship bound for the city of Tunis. From the ship he threw the stone far out into the sea, but upon arriving in Tunis he found it sewn as firmly as ever in the hem of his cape. Only now, when he examined the ruby, he saw in its depths a small flaw, a black speck that had not been there before, and he wondered if the Highest had sifted him and found him wanting. He turned his attention to the past. In Tunis, he wrote his Sefer Yuhasin, tracing the genealogy of his people back to Creation. On the day he finished it, on the other side of the world, Cristobal Colon consulted the Rabbi’s astronomical tables and understood that he could save himself and his men with what he found there, an impending lunar eclipse, foretold to the exact hour. Also on this day, the Rabbi’s old housekeeper Mirem, having been worn down by her Inquisitors, was burned at the stake in Lisbon after admitting to certain Judaizing practices. The ruby remained with Rabbi Abraham to the end of his days. It carried him from Tunis to Cairo to Jerusalem to Damascus and finally to Istanbul, where he died, it is said, sometime after 1515. Whenever the need to flee arose, he exchanged the ruby for safe passage, only to find that it had returned, sewn into the hem of his round cape, its deep flaw more pronounced than ever. In the end, the black speck had grown to a cloud, eclipsing all the brilliance of the ruby, and the Rabbi, seeing this, was grateful to know that he would soon be gathered in. My chief inspiration as a fantasy writer is history, what of I know of it and what I learn of it through my reading and travel. I am especially drawn to stories of persecution or oppression, in which fantasy elements can play such a crucial and liberating role. I first read of Abraham Zacuto in Ronald Sanders's Lost Tribes and Promised Lands, and afterwards could not forget him. I knew I would write something in homage to Zacuto, but it wasn't until I began writing about him that the fantasy element, the ruby Mirem sews into the hem of his cape, emerged, a startling gift from the past. Wonderful story, I love how you mix history, mystery, non fiction & fiction. A similar story exists about Zacuto and his Children called "The Broken Bracelet" by Gershon Kranzler. I ordered it from Borders Books. Abraham Zacuto is my 17th great grandfather and my business Zacuto is named after him. This is a beautiful story! I love the element of truth (the dark speck) embedded in the magical talisman of the ruby. It conjures dreams and images from a deep place in human history. Well done! Marlane M.